Human rights are at a crossroads. This book considers how these rights can be reconstructed in challenging times, with changes in the pathways to the realization of human rights and new developments in human rights law and policy, illustrated with case studies from Africa, Europe, and the Americas. Contesting Human Rights traces the balance between the dynamics of diffusion, resistance and innovation in the field. 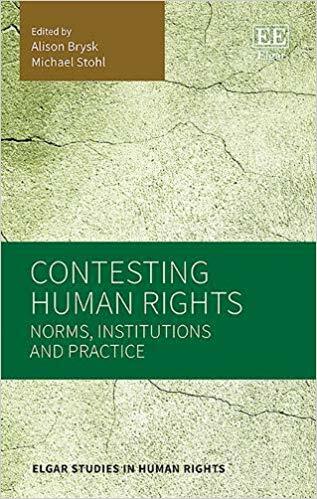 The book examines a range of issues from the effectiveness of norm-promotion by advocacy campaigns to the backlash facing human rights advocates. The expert contributors suggest that new opportunities at and below the state level, and creative contests of global governance, can help reconstruct human rights in the face of modern challenges. Critical case studies trace new pathways emerging in the United Nations’ Universal Periodic Review, regional human rights courts, constitutional incorporation of international norms, and human rights cities. With its innovative approach to human rights and comprehensive coverage of global, national and regional trends, Contesting Human Rights will be an invaluable tool for scholars and students of human rights, global governance, law and politics. It will also be useful for human rights advocates with a keen interest in the evolution of the human rights landscape.